(Longueuil, Que.) The reigning champions, Edmonton Inferno will face off for a second consecutive national title at the 2016 Canadian Wheelchair Basketball League (CWBL) Women’s National Championship, after emerging unscathed in the round robin competition at Centre sportif Édouard-Montpetit in Longueuil, Que. The Calgary Rollers will take on the B.C. Breakers for the bronze medal. The bronze and gold medal games will unfold on Sunday at 9:00 a.m. ET and 10:45 a.m. ET, respectively. The Edmonton Inferno started the second day of competition with a 57-15 win against Team Ontario. Arinn Young led the Inferno’s offense with a total of 26 points, while Tamara Steeve responded with 10 points for Ontario. Quebec added a second win to their record with a 67-41 win over the Calgary Rollers. After taking a tentative lead in the first quarter Quebec pulled ahead with a 17 point lead at halftime. Continuing to dictate the pace of the game the Quebec players were unrelenting in their offense and Calgary was unable to close the gap. Rosalie Lalonde led all Quebec players with 18 points, while Diane Sorensen produced a team-high 14 points for the Rollers. The Edmonton Inferno improved to 4-0 with a convincing 65-36 decision over the B.C. Breakers in the afternoon. With the win, the Inferno advanced to the gold medal game and will vie for a ninth national championship title. Arinn Young scored 27 points to lead all Edmonton players, while Amanda Yan was the top point producer for the Breakers with 11 points. 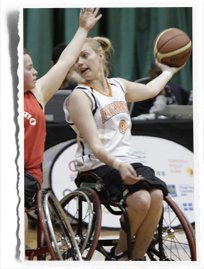 The Calgary Rollers (2-2) defeated Ontario 55-26 to secure its place in the bronze medal game. Erica Gavel led the Rollers with 14 points. Tamara Steeve tallied 10 points as the top scorer for Ontario. Team Ontario (0-4) concluded the tournament in fifth place. The second day of round robin ended with Quebec (3-1) securing their spot in the championship finals with a 68-44 win against the B.C. Breakers (1-3). Rosalie Lalonde paced the Quebec offense with 17 points while Amanda Yan topped all players with 20 points for B.C. With their 3-1 record the Breakers have earned a berth to the bronze medal contest.